Hey, everybody. My wife and I just joined. The big draw for us was the touring events. We've been a member of the Lincoln club for years and we've enjoyed that aspect of it. 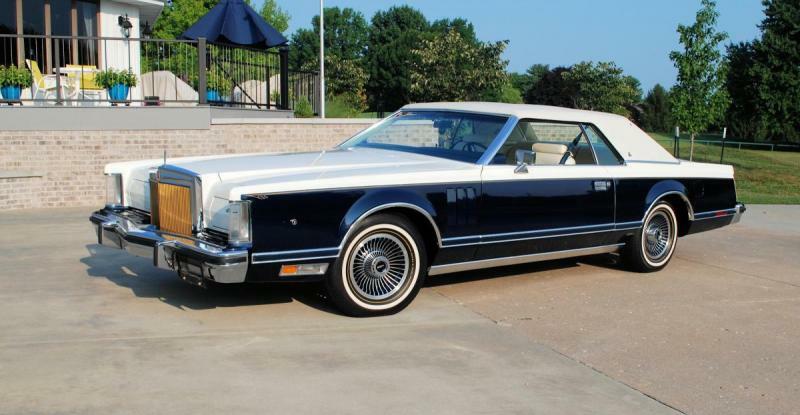 My concern is that except for two 1979 Lincoln Mark Vs, all of our vehicles are modified to some degree. Are we eligible to participate at the National and Regional level? Welcome! Touring indeed provides a lot of enjoyment. You'll have a blast making new friends and seeing things you would not ordinarily be able to such as private car collections and historic sites that are not often available to the general public. The Lincoln should make a fine tour car for you and the family, but what kind of modifications have you made? It's one thing to "modernize" the AC system and install an upgraded sound-system for touring comfort/enjoyment, but mag wheels, wild paint jobs, and anything that obviously detracts from representation of an authentic vehicle would not be appropriate on a tour. If you have questions about whether a specific modification is acceptable, just ask and I'm sure you'll get good response. Many of our local Regions and Chapters also have tours and for those events, some of the guidelines may be slightly different, but for National events the below info should be helpful. (extracted from the AACA Policy and Procedure Manual). witnesses AACA National Tours, the appearance of authenticity of participating vehicles is a primary concern. Therefore, to achieve this purpose, most of the body, engine, chassis, and driveline components of all vehicles entered in a National Tour need to be of the same vintage as when the vehicle was manufactured. Vehicles that are obviously “modified” from the original design present an inappropriate impression as to the aim and purpose of the AACA and will not be accepted. The foregoing is not meant to exclude vintage accessories available when the vehicle was manufactured. Any advertisements displayed on a vehicle must be appropriate to the era of the vehicle manufacture.Safety is paramount in a tour environment. Vintage performance modifications are acceptable so long as safety is not compromised. Radial tires, original type tires of a different size from original and white sidewalls of a different width than original are acceptable, provided they are mounted on original style wheels. Seat belts are acceptable and recommended. Hydraulic brake modifications are acceptable provided they have been done in an unobtrusive and professional manner. 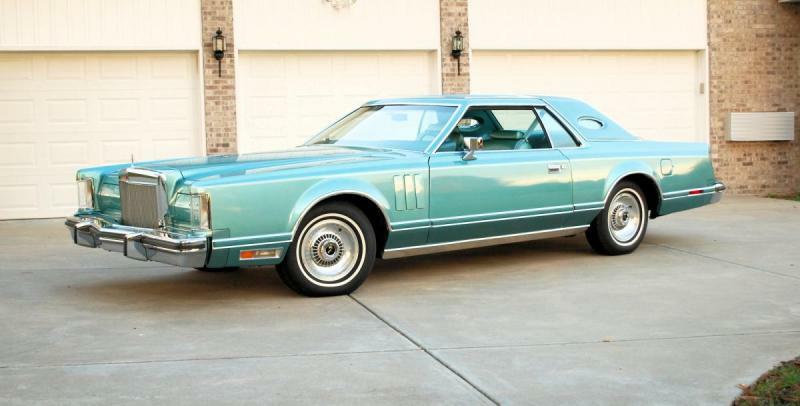 This 1979 Mark V is extremely pristine and has original paint, top, interior. I've added fuel injection to solve fuel issues, but it's invisible to the eye. This is my other 1979 Mark V, all original and more of a driver (not quite as pristine, but still very nice). This is a work in progress. It's a 1963 Buick LeSabre wagon. It's being rebuilt to stock specs. The only modification is 17" Torque Thrust wheels. The side exit exhaust is going away. This one is probably not eligible due to the wheels, correct? Nice cars! Those Lincolns I'm sure would be welcome on a national tour that covers those years. They are great looking cars. The Buick is neat, but you are correct. I see you list a "1963 GTO Phantom among your collection as well - as a big GTO fan I must admit that I've never seen or heard of such a vehicle - can you post some photos and tell me more about it? Pic of my 67 is below. Glad you have joined and we do have some great tours. Easy call as Terry says on the Lincolns. I personally would not think the Buick would be automatically excluded these days. The car from all other categories meets our rules but on certain national tours I think the chairman might accept the wagon. Very cool wagon and certainly most local tours would accept it. Close call but in my opinion too nice of a car to exclude! 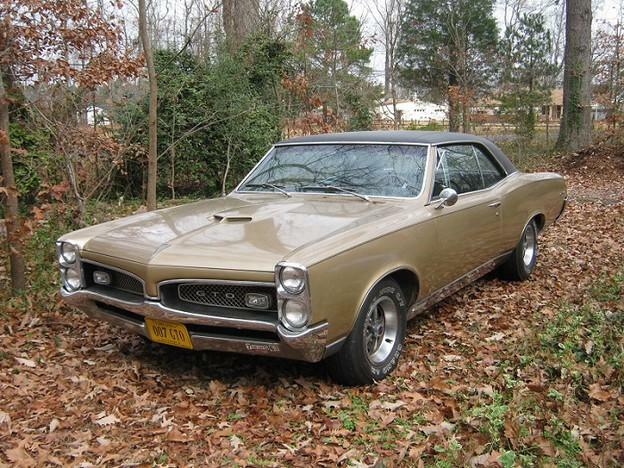 Terry, the phantom GTO idea came about when I spotted a rust-free '63 LeMans on eBay. It got me to thinking, what if JZD had started the GTO project a year earlier on the smaller, lighter car? To my knowledge, no one has built a '63 GTO. I like unusual stuff, and I have a great builder who does superb work. He's also a GTO freak. We kicked around the idea and decided to go with it. The LeMans has the "half-a-V8", rope drive and transaxle. That will all come out and be replaced with a Pontiac 400, 200-R4 and conventional rear end. The idea is to create a 1963 GTO as if were sitting on the showroom floor in 1963. Since there is no such thing as a 1963 GTO, we have a blank canvas. It will most likely be 1970 Turquoise Mist with white interior. We're going to add fuel injection, but you won't see it when the factory 1964 GTO air cleaner is in place. We're going to add Vintage Air, not much way of hiding that. We'll have disc brakes, but the steel wheels and poverty caps will hide them. We want the retro look with modern amenities. Right now, the car is torn down and we have parts coming. The engine is at the machine shop. The trans and rear end are at the shop. The interior is also at the shop. We're hoping to be finished by the end of the year, but he only has one painter and that's a bottleneck. It should be quite the conversation piece when finished. It was a lot of work, but he made it look like a factory installation. This is the kind of quality we're going for with the '63 GTO. Actually Pontiac Division did make some 1963 Tempest as you described and more. 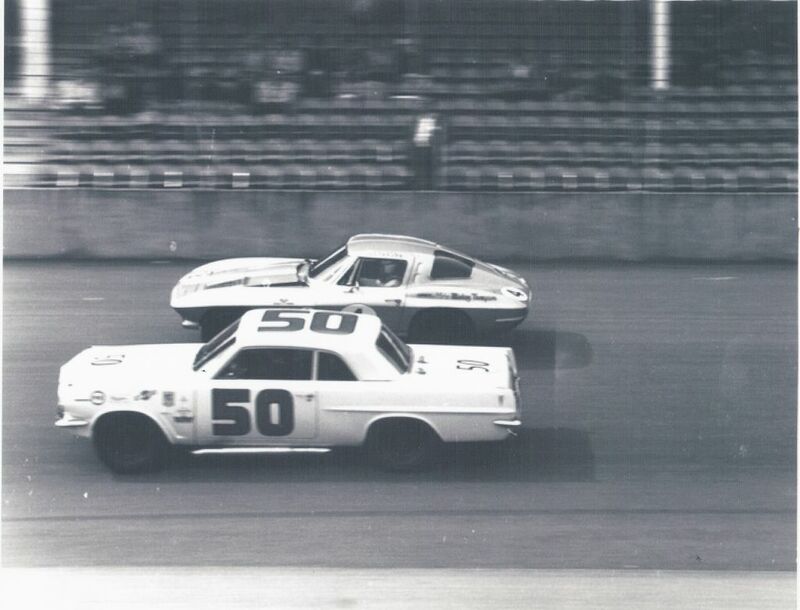 Pontiac made 6 Tempest Wagons and 6 LeMans coupes but only for racing. Pontiac kept the innovative transaxle for better weight distribution and handling , but modified and beefed it up. 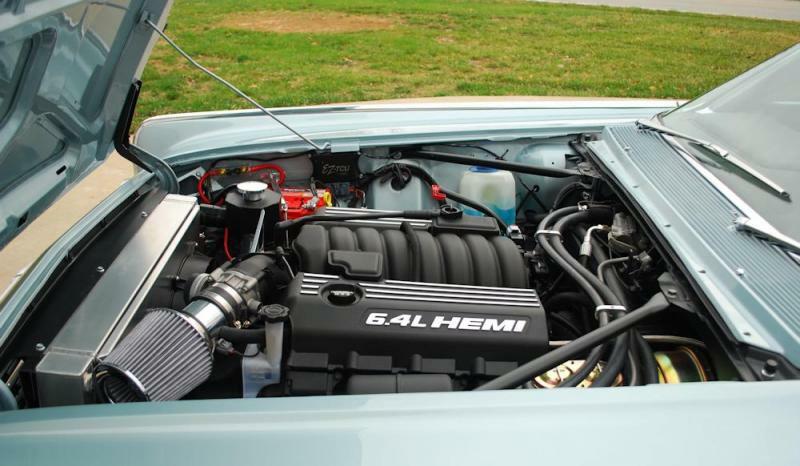 They added a section to the split torque 2 speed automatic making it a four speed, removed the torque converter and added a dry clutch turning it into a four speed automatic stick shift called the Power Shift. No 389's for these cars as the factory inserted the 421" SUPER DUTY" Pontiac engine. In drag racing this configuration quickly moved from S/S to "Factory Experimental" or F/X and as we all know by 1964 1/2 turned into Funny Cars. One of the cars went to Ray Nichels Engineering who prepped the car for NASCAR 1963 speed weeks 250 mile "Challenge Cup" . The challenge cup was a anything goes race. Corvette, Porsche, Ferrari and anything else you would wish to bear. The Nichels prepped Pontiac LeMans won the race with Pontiac Driver Paul Goldsmith driving. Goldsmith's nearest competitor was A.J. 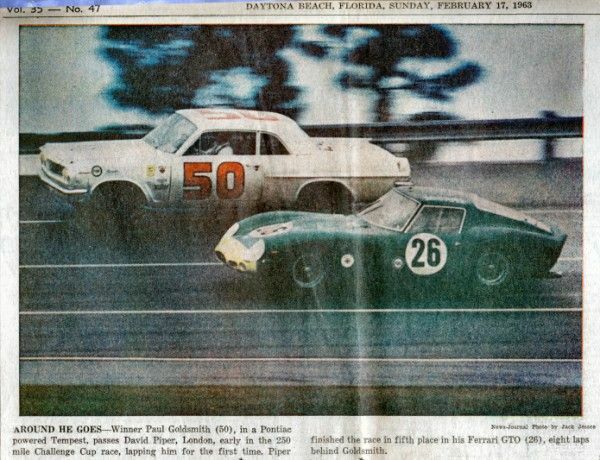 Foyt in a F/I Corvette, and Goldsmith beat Foyt by FIVE Miles! If you want to build a 1963 Pontiac GTO, build it the way Pontiac Engineering built it. NOT with a conventional driveline. Yes, I remember those 63's with the 421s. Actually had a friend in college who dropped a 421 into a 63 Lemans, but had a slight problem. One night coming home from work, while stopped at a red light in Kalamazoo, Michigan, the weight of the engine decided to collapse the front suspension. Don't know what ever became of that project, but according to him, the extra weight caused all sorts of steering issues. Such is the plight of an amateur engineer I guess. Thanks for the info on your Phantom, and yes, Steve is correct, that station wagon is a neat looking car and some of our tour chairmen would welcome it, but ah, those Lincolns - pure cruising pleasure! The only modification is 17" Torque Thrust wheels. I have seen Model A's on tour with V8 wheels and radial tires. Also seen T's with wire wheels that they never came with so I would say welcome. Terry, Just a FYI. 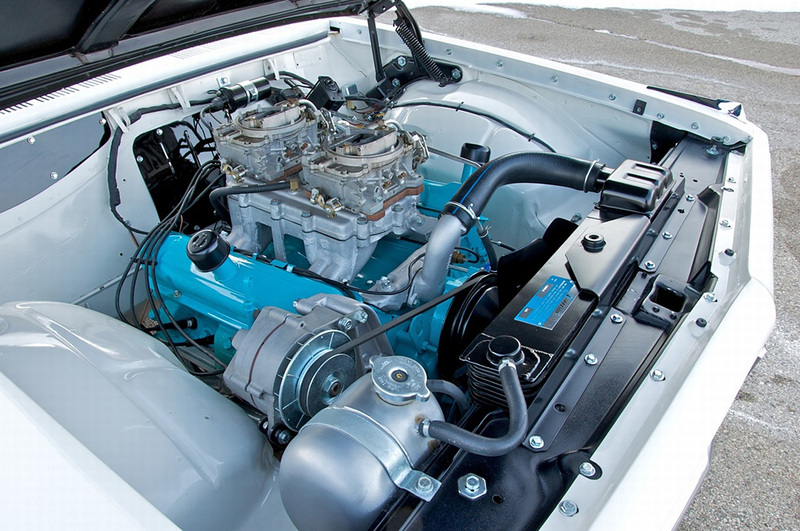 In 1963 Pontiac re-cored all it's V-8 engines for weight reduction. In 1963 the 326 ( which really was a 336 and wasn't a 326 until 1964 ) was about 50 lbs. less than the 421 and 30Lbs. less than a 389, The SD 421'a were even lighter by about 20 Lbs. because of a aluminum intake. The Indy 4 which was 1/2 of the Pontiac 389 V-8 weighed 161 lbs. less than the 389. If your friends car was a 195 " Indy Four 200 lbs. would hardly collapse a unequal A arm suspension. The only difference in the 336vs the 195 suspension is the spring rate and all the rest is the same. If your friends car was originally a 336 the effect would be nil. No idea on specifics and as I recall the story, the 421 he used was a junk yard special and who knows what engine was originally in the car. This was back in 1968 in Michigan where rust may have also had some impact on the durability of under-side components. This was all very unsophisticated hot rod building done in his driveway. It was a neat idea and a good try but I think it is best categorized as a trial and error experience. I am getting dusty memories of long distance touring Model T's with C-4 Ford automatic transmissions. That at was my first thought, but they’re made of unobtanium. And the repro wheels for the A-bodies are the wrong bolt pattern. I just went on eBay and found a set of full size 15" wildcat wheels for sale. This is DOABLE.